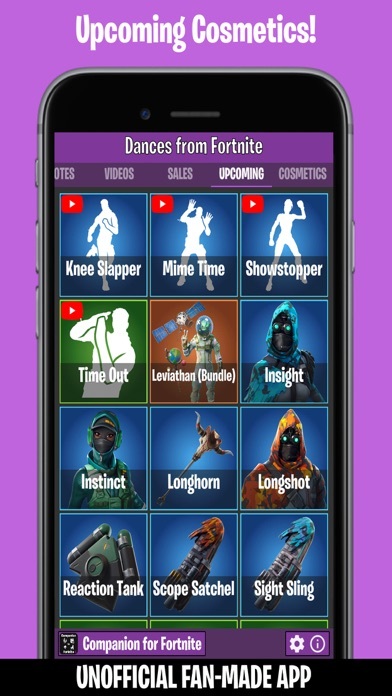 Videos of all dances and emotes, leaks, daily shop, images for all cosmetics. 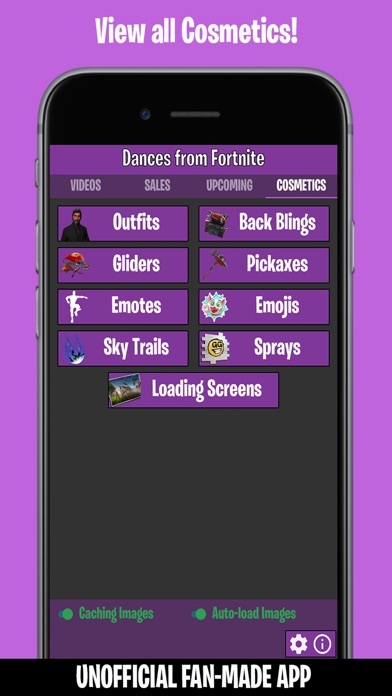 - Videos of all the Fortnite emotes - View videos in slow motion or high speed - View upcoming and leaked cosmetics - Notifications when there's news or when an Emote added - View the daily sales with image, video and vBucks price - Browse all cosmetics in Fortnite: emotes, outfits, gliders, back blings, emojis, pickaxes, skydive trails, sprays and loading screens. Listing includes the vbucks price or requirement to unlock (e.g. 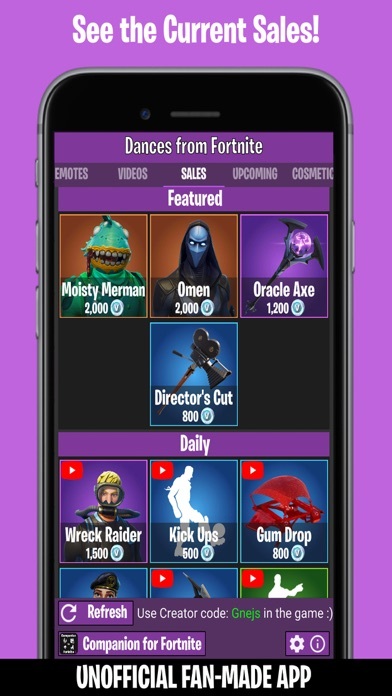 Battle Pass level) - Random Emote - Let the App decide the next Emote to view The App does not require an internet connection when viewing videos but the Daily Sales and Loading of new cosmetics will only work if the device is connected to the internet since the information is external. Videos are added as soon as they are released and can be downloaded via the App without requiring an update of the App, this requires an internet connection as well. 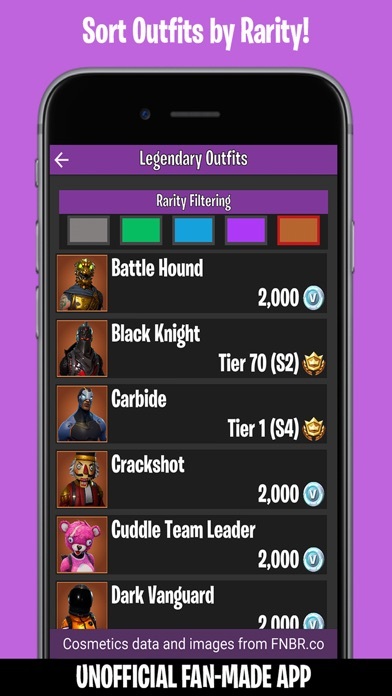 This is an Unofficial Community Driven Fortnite App and has NO affiliation with Epic Games™ This App is adhering to the Fan Content Policy created by Epic: https://www.epicgames.com/site/en-US/fan-art-policy?lang=en-US Portions of the materials used are trademarks and/or copyrighted works of Epic Games, Inc. All rights reserved by Epic. This material is not official and is not endorsed by Epic. Legal Notice: Epic Games, Inc. Epic, Epic Games, the Epic Games logo, Fortnite and the Fortnite logo are trademarks or registered trademarks of Epic Games, Inc. in the United States of America and elsewhere. All rights reserved. this app is really good. I love the fact that i can see leaks and items soon to come, because it takes a while to search that stuff up on the internet. I have a recommendation: search by special marks? this would be helpful, especially with all of the travercial emotes and amimated wraps/sprays. definitely 5 stars! This game will be fun. So much fun. Just wish there were no adds. This is Amazing. You get to see all e-motes even rare ones in Fortnite. I rated this app 4 stars because it got every emote and cosmetics.But it would be great if it had the trailers. All of the emotes are cool. And all of the stuff is cool. And me and my dad we played emote war. 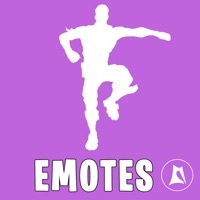 So what we did is one person would choose a emote and one person would do the emote that the other person picked. It’s a very great app!! 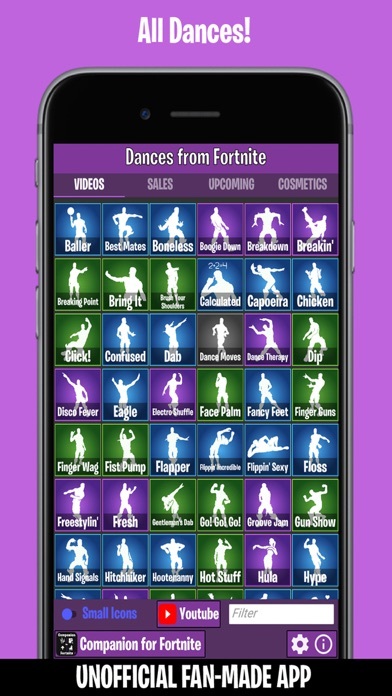 If you want to learn a new dance in Fortnite, this is the app for you. 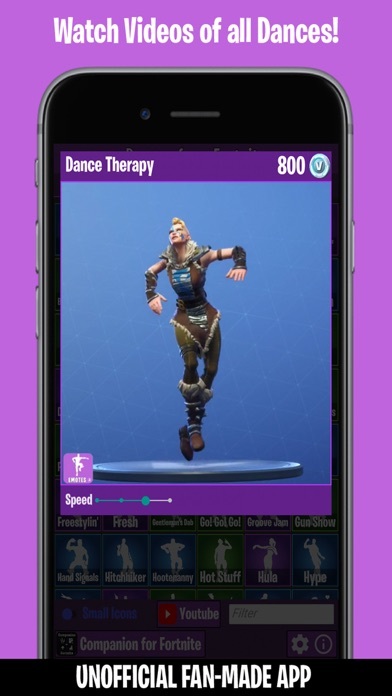 If you like to hear the beat of the emote this is also the app for that!!! A good way to see and hear emotes you’ve never heard of or you can just hear emotes. If this game is so perfect as other reviews claim it is, there should not be so much server delinquency. I know most people wanted an interesting review, but there’s really not much to say when there is either no signal or the signal is so slow it won’t matter “this” much. Just look up these dances on YouTube or DuckDuckGo or something else. Fix ur app or I’m not coming back. I love that it is free, I tried other games and you had to unlock dances (pay for them) and ads came up every 5 seconds. This app has none of this. GREAT APP! !